Saudi Arabia's leading religious authority, Grand Mufti Abdelaziz Al Sheikh, has put a fatwa on chess in advance of a tournament scheduled to be held in the holy city of Mecca. To be sure, some of his indictments of the game have merit. For example, he calls it “the work of Satan,” and who of sound mind, from novice to master, could object, as in who but Lucifer himself could have cooked this game up? Chess queen found on the Isle of Lewis in the early 1800s, as part of a set carved out of walrus tusk and whale bone, circa 12th century. The Mufti argues, further, that chess "leads to rivalry and enmity." 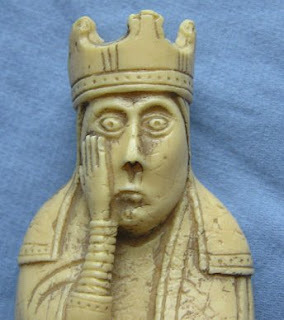 Losing in chess does indeed provoke anxiety and dire imaginings, suicidal and homicidal. This is BFS, Bobby Fischer Syndrome. And Fischer hadn't even lost when he lost his cookies: the very thought of losing — losing, ever, again, even once— was enough to bring out all that was broken and bonkers in him, which was plenty. Winning was all that could quiet him. But I'm not yet ready to convert to the Wahibi version of Islam (or, for some strange reason, any other version) despite the insights of the fatwa-hurling Mufti. I prefer to align myself with Muslim advocates of chess who have tweeted, contra said Mufti, that "chess is an intelligent game and that is why conservative clerics decry it." And there's no doubt that the Mufti was talking about some other pursuit when he said chess makes "rich people poor and poor people rich." Perhaps he was thinking of backgammon. 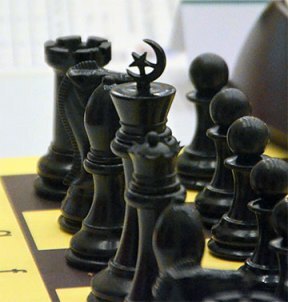 Islam has had a fruitful but conflicted relationship to chess. Muslims both brought the game to Europe — along with the works of Plato and some basics of arithmetic — and shied away from it. 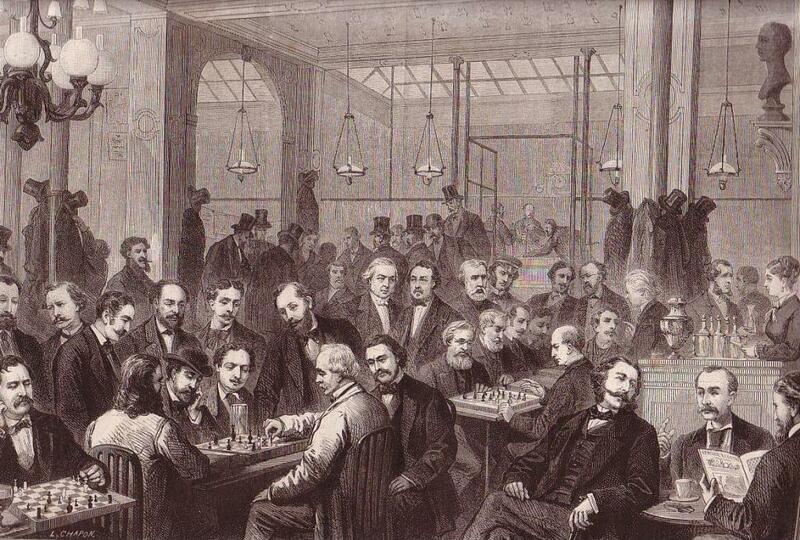 They authored the first serious studies of chess, but their tension about it extended to representation of the pieces. Islam took the second commandment's ban on graven images very seriously. Thus, on their chess sets, the horse, which we call the knight, was not allowed to bear any resemblance to an actual horse; it had to be represented abstractly, by means of an assortment of holes poked into the exterior. Same with the elephant. (Yes, the elephant was once an active piece: Chinese chess, xiangqi, is known, for short, as elephant chess). As for the queen, well, she was no problem for Muslim chess, since there was no queen. 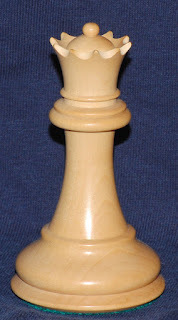 There is no queen in Chinese chess either. Make of it what you will, the queen is a European innovation. 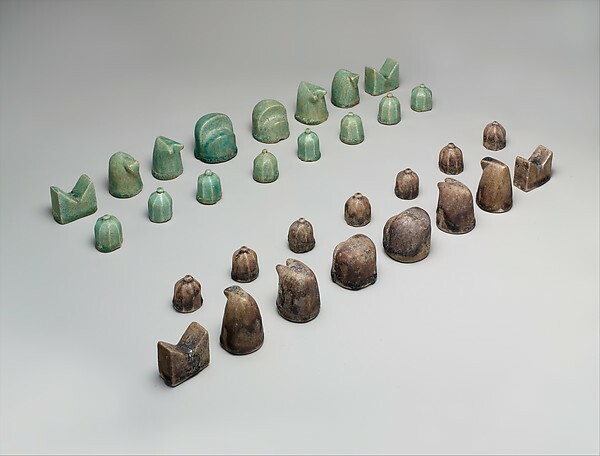 It should be said that these abstract Islamic chess pieces are beautiful, in an unexpectedly modern way. Islam still argues with itself about chess. Chess once stood for Enlightenment reason as opposed to clerical and feudal rule. The Cafe de la Regence was a place where Ben Franklin might be found playing, along with Jean-Jacques Rousseau. The Saudi/Wahabist monarchy still contends with a contemporary version of the Cafe de la Regence. Alas for the Saudi/Wahabist monarchy. Muslim use: star and crescent rather than cross on his head. At issue is the Bishop who -much like his counterpart the Mufti - needed serious appeasement in order to stop him from pronouncing the game the stuff of satan. It is suggested here, that in order to do so, full recognition, a worthy one, which will forever honor his formidable rank altogether in a very concrete way (at the very least within the game) was thusly granted in the form of a permanent name-piece. Obviously this regrettable honor was a good replacement for the elephantry: first, as they are just very big animals and as with all animals, could not argue for themselves at all, and indeed are thus the most obvious target; second, who ever heard of elephants being of any importance anyhow? right! strike two... third, all other candidates were not about to give their spot to the monster Bishop no matter what, honor first, games later sort of a thing... and so, by the power vested, will therefor pay for it next, and reminded of that forever too! The others lost (or kept) face as per their relation to the Bishops: the knights remained loyal and thus were just turned into horses (to keep them at bay), The infantry for what they are were now simply pawns, the chariots since by then they were a figment of history of a different time and age altogether (or perhaps still free in some way, as in being the competition) were fittingly turned into stone as in the castle (but another clue may be in the arabic word ruuk). This left a few note wirthy ones, with the very top remaining for the king... and yes, this is when there appears queen in a move to solidify the whole thing, for what is a king if there is no queen but a lonely novelty in a dangerous position, with no ears or mind or life really? perhaps it is indeed the case, as the king cannot simply trust any of them on their own (until they are all under real duress, when they suddenly -one would hope- remember their last honor etc),but then, being what they are, they would certainly be willing to do something for the queen under other conditions (the bishops almost an exception here too?) and if while minding the queen they would be wiped, so be it (silly creatures as they are, to begin with). 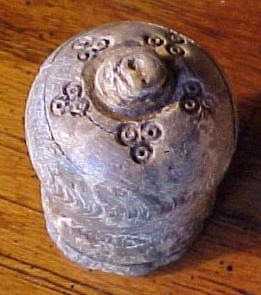 The bishop is genetically similar to the elephant, a piece in Chinese & early Indian chess. Both bishop and elephant move diagonally, though the elephant is more limited in range. The bishop is still called "alphie" in Spanish, reflecting the Arabic word for elephant. Excellent, H.B. The expression on the face of that queen from the Isle of Lewis-- says it all!